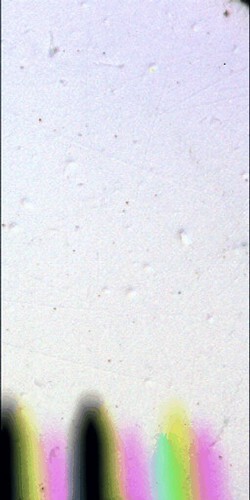 OK, the first MECA Optical Microscope images are down. I am guessing this was lit with the RGB LEDs on the botton of the picture -- but I'm totally unsure. The UV illumination sequence makes no sense to me. If I understand correctly, the CCD is not sensitive to the UV light, so only objects that reradiate in the visible should be visible. But in fact the entire field of view is visible with UV illumination? Maybe this substrate is made of a florescent material? If so, why don't the bright dust particles in the Green image block the light from the substrate? Very interesting, I wouldn't assume that to be liquid water since the temperature range on Mars is fairly low. I dont believe that there are any other liquids on the surface / in the atmosphere of Mars. What are these pictures of? What is the microscope looking at? Where is this picture taken? Is it a picture of the sample in the scoop? Can the sample be heated? "Hold on, there cannot be any liquid water on mars due to the low pressure, perhaps the sample medium can also be pressurized?" UV lights are often used in mineralogy. I think UV vflouresecence is the main reason. Rock hounds use UV lights of specific wavelenghts to easily pick out minerals they are looking for at night. I imagine phoenix has UV illumination for the same reason. The optical microscope is part of the MECA package. samples are input to the MECA package by a rotating sample wheel with 10 sets of 6 different substrates. I suspect the tests are looking at either "calibration" substrates or "bucket" substrates. I would suspect that the "wet chemisty beakers" are pressurized ( Mars, you know ) -- but I don't know that for a fact. All the .pdf papers googled on various sites describing the technical details of MECA are strangely unresponsive. 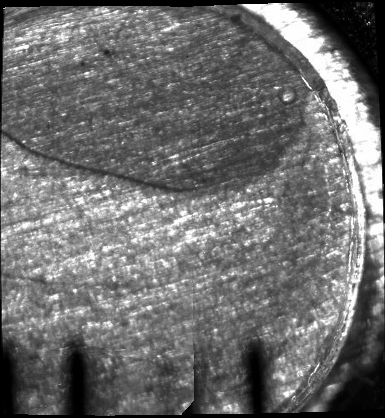 Perhaps the little clear drop is an interplanetary joke played by the creaters of the sample wheel. The FAMARS part of MRCA will be a new scale of Mars exploration. This makes it clear. I bet these are calibration pictures that we are looking at, since the scoop hasnt been "used" yet. This animation puzzles me. What exactly> is being imaged? I an guessing that some of the dark spots are dust on some protective plate between the OM and the samples, and some of the straight dark filaments with shadows are some unknown fibers caught on the other side of the plate. But what are the small, bright raised blobs of material on the substrate -- especially what is the short rod shaped blob center left? There appears to be a complex network of raised linear features ( not depressions ) all over the substrata. What is this substrate -- and what does the expected image look like? Sure would like to see an "official" version with explanation of these images. Be warned that there are a lot of GIF color artifacts in the animation. Again, Where are the OM raw images? I think the image at reply 7 is the rotating sample wheel (SWTS) to deliver samples to the optical and atomic force microscopes taken with the afm. Did you find the page here with limited information on substrates ("ten sets of six materials" is kinda vague)but apparently they can apply different polymers and clean them up when they are done. They have some good sample images as well. I agree with max that this most likely is a calibration sequence. The last link from curious1 seeems to be avery nicely laid out site. Although when you say "raw", they appear to be just compressed jpg junk. Not realy RAW's, no RAW converters, Wait, i'm getting caught up in deja vu. ok, i feel better now, thank you NASA for sharing these images with us. Have they used the optical microscope yet horton? Er, I have not made myself clear. The only raw images posted were from test images from sol 4 ( seen in reply 0 and again in reply 7 ) - yet the OM was used on sol 9 to create this image -- according to the press release. Where are the sol 9 OM raw images? No raw OM images posted... depressing... just depressing. Wonder what the oval shaped particle is un the upper left corner? Yes, what is that oval particle? What is that filament to the lower left of the oval particle? It's well over 1/2mm long (nearly 1 mm if you could straighten it out). Maybe it's a primitive insectoid guarding it's egg? A grain of quartz next to a filament from the lander? The scale bar at the lower left is 1 mm long. Pretty neat seeing that kind of resolution. Look at all of the particles less than 0.075mm in diameter! Typically particles less than 0.075mm in diameter are considered silts and clays (on Earth). Silt and clay on Mars, right before our eyes! Here is a 2x version of reply 15 created from the NASA TIF version for those of you who wish to examine the image in detail but are too lazy to download the original. We will see the original raw images when the powers that be are absolutely sure there is nothing interesting to see that they haven't already seen. I hope to live that long. The blue candlestick on the left hand side(middle) is the most interesting feature of all. I've been convinced for a long time that these are living things connected to the canisters, which contain some type of silvery liquid. We ran over one with MER, remember? The fact that it appears blue is interesting, also. They're not imaginary, and it's becoming more and more obvious. When we go to blow these candles out, and we will eventually, do you suppose that we will find that these things have a protector of some kind? Sorry, I was referring to Horton's post 15 and the really good microscopic photo in it. Much thanks to NASA for this one.